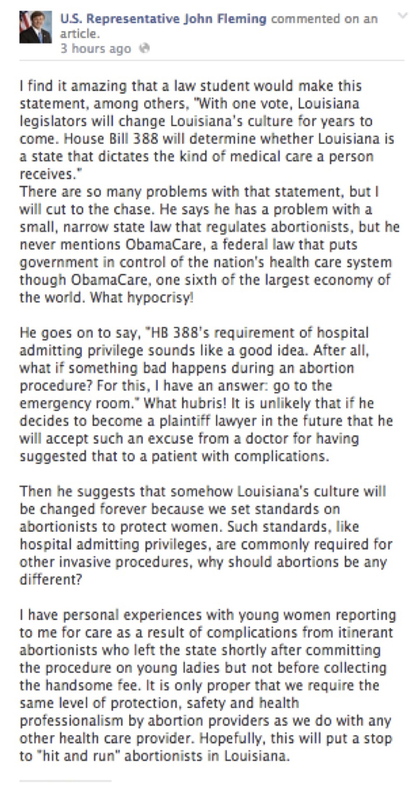 Dr. John Fleming, an anti-abortion Republican Congressman from Louisiana, flipped the script yesterday, coming out as an apparent advocate of some abortions -- namely, safe ones. Dr. Fleming's turnaround on one of his core platform issues -- outlawing abortion -- has gone largely overlooked. But it happened. Dr. Fleming apparently has changed his mind, with Facebook and comments to a column in a local newspaper as his media of choice. How did we get to this absurd place? It all began because the Louisiana House of Representatives is poised to pass an abortion-restriction measure similar to the one Wendy Davis opposed in Texas that was recently deemed constitutionally valid by the U.S. Fifth Circuit Court of Appeals. The Louisiana bill would restrict access to abortion care by requiring that the few abortion doctors in Louisiana obtain admitting privileges from a local hospital. Unsurprisingly, Dr. Fleming supports this bill (but only rhetorically -- he's not a member of any legislative body that is actually considering it). On Thursday, I wrote in the Shreveport (La.) Times, the largest newspaper in Dr. Fleming's district, that the bill would be the death knell of nearly a century of Louisiana policy and culture aimed at providing poor and rural Louisianans with the same access to basic human institutions as their wealthier and urban compatriots. Then things got weird. Dr. Fleming not only read, but also shared and commented on my column! This was very exciting. Lawmakers like Dr. Fleming are the reason I speak out on important issues, and rarely do U.S. Congressmen have time to directly respond. I wrote the Times column in an attempt to spark meaningful conversation about poverty and health care in Louisiana, and maybe even persuade some people to think beyond themselves. What I never expected was that my column would become Dr. Fleming's springboard for announcing he has moderated his abortion access position. Dr. Fleming's public comments on the Times' website, which are cross-posted to his own Facebook page, speak for themselves. Dr. Fleming appears to now support abortion. His support is tepid, but it's there. Dr. Fleming supports abortion care, as long as doctors who provide abortions are subject to the same standards as other health care providers. This new moderate position will surely come as a surprise to the good doctor's constituents. What may come as more of a surprise is Dr. Fleming's allusion to the procedures he himself has performed: botched abortion clean-ups. Dr. Fleming could be saying that he has first-hand experience treating women whose bodies were mutilated by illegal, unsafe back alley abortions. Or Dr. Fleming could be alluding to having to complete abortions started by inept, unethical health care predators. Unfortunately for Dr. Fleming, neither scenario supports his previous position as an anti-abortion stalwart. Perhaps Dr. Fleming's dogged anti-choice advocacy was designed to end abortion altogether and prevent other doctors from facing the horror of cleaning up after a back alley abortion. 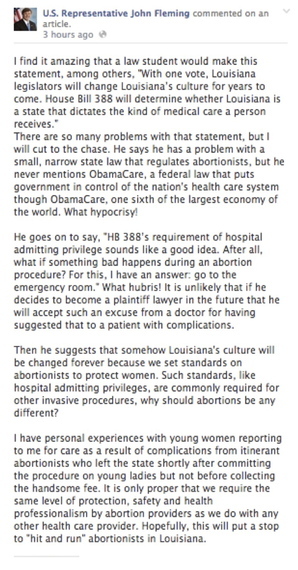 That argument sounds much more pro-choice than Dr. Fleming's usual rhetoric. After all, one reason abortions were legalized in the first place was to stymie an epidemic of dangerous, unregulated abortions. Forcing most abortion doctors to close shop, which is what Louisiana's pending bill will do, increases the chance that other family doctors will be left to clean up more back alley abortions. Dr. Fleming surely knows that -- hence his apparent decision to support safe abortion. Dr. Fleming does shield himself from a constituency backlash. He only supports access if doctors providing abortion care are subject to the same standards of protection and safety as other health care providers. But Dr. Fleming does not say which health care providers are his baseline. All doctors are not alike. A doctor performing a heart bypass will necessarily be held to professional standards different from a family physician. The American Congress of Obstetricians and Gynecologists has publicly advocated against legislation that would single out abortion providers and impose regulations that "are more stringent for abortion than for other surgical procedures of similar low risk." As a federal trial judge wrote when enjoining a Wisconsin law similar to Louisiana's bill from going into effect, "[W]ere a procedure sufficiently dangerous as to require, or even have a substantial risk of, hospitalization, it would likely be performed in a hospital." That judge noted that procedures 10 times as dangerous as safe abortions were not subject to admitting privilege requirements. Maybe Dr. Fleming simply means that it is reasonable to hold abortion doctors to the same standards as health care providers who, generally in an outpatient setting and without being required to obtain admitting privileges at a local hospital, perform surgery that is nearly 30 times as likely to lead to death. The procedure is one the American Cancer Society recommends the average person get at least once every 10 years from the time they turn 50. Its mortality rate is 20 in every 100,000 procedures, compared to .67 in 100,000 for safe abortions. The procedure? A colonoscopy. Colonoscopies in ambulatory surgical centers -- that is an outpatient doctor's office where the person does not stay overnight -- in Louisiana are performed in a regulatory Wild West. The regulations ensuring safety at those offices are minimal at best. Basically, the doctor performing an outpatient colonoscopy only has to be in good standing and on a hospital's staff -- which does not equate with having admitting privileges. Surely, Dr. Fleming would support using the standards for colonoscopy doctors as a baseline for abortion doctors -- a position which would not include admitting privileges or other new restrictions. Dr. Fleming's comments continued Friday, attacking a straw man -- the hit-and-run highwayman "abortionist" (Dr. Fleming never says whether he is speaking of unethical doctors or back alley snake oil salesmen). But Dr. Fleming's statements have not veered from his apparent new position that abortions are okay, as long as they are performed by doctors in safe conditions for patients.